Every community has its own unique interests and passions, and when I served in northern New Jersey in the 1980s, that interest was gardening. In Westwood and the three towns surrounding (Emerson, Hillsdale, and Park Ridge), garden clubs were the rage. To be a pastor seeking to connect with the community, one need to be willing to sit in on afternoon long garden club meetings. What I found fascinating was how very different each one was, and the memories I have of the four garden clubs form a metaphor and model of four church types. In Westwood, women (and a few men) would gather for very nice sit-down catered luncheons where various members would share slide shows of their personal gardens. A number of garden club members never actually touched seed, soil or spray, but paid large sums of money to have others do the work for them. They hired landscapers and gardeners, consulted horticulturists and botanists. They poured through catalogs and ordered rare and wonderful fauna from all over the world. They transformed their living spaces into natural wonderlands, took pictures, and then gathered to compare notes on what fabulous gardens they had. The spirit was one of competition, admiration, and more than a subtle smidge of jealousy. The desire to have the ultimate garden paradise was strong throughout. They loved the beauty and grandeur — the idea of gardens as much as the garden itself. The garden was a place to relax and enjoy. The Emerson Ladies’ Garden Club had sandwich platters brought in and they sat in a big circle balancing paper plates on their knees while they swapped techniques, tools, and tips on gardening. They talked about their various gardens — flower and vegetable — and how they worked miracles in the soil to maximize produce, minimize pests, and mitigate predators. Small circles would be huddled, head’s together, sounding more like generals planning armed assault than hobbyists sharing secrets. Each and every woman in the group had dirt under her fingernails and grass-stained dimples on their knees. The gardening they talked about was from the trenches. They loved the act of gardening and dedicated a significant amount of time and energy to perfecting their art. They, too, loved the beauty and the grandeur, but they loved the fact that they had something to do with creating and crafting it. The Park Ridge Garden Club had a mission statement: to help Park Ridge become a garden community. This club taught gardening to children, youth and adults. This club coordinated clean-up, spruce-up projects throughout the township. This club laid in flower beds along roadways, and filled planters throughout the town square. This club petitioned the town council to make beautification a priority on its regular agenda. This club led campaigns to promote landscaping and gardening in every neighborhood. They hosted festivals and garden parties. They did a “parade of gardens” tour through the town. They were advocates and evangelists for the art and science of gardening, spreading their visions and passion anywhere and everywhere they could — seeding the community with a goal of transforming their town into one big garden. But they didn’t stop there. They offered their services to other towns and boroughs, and invited folks from far and wide to join them in their mania. The Garden Club in Hillsdale rana community garden long before community gardens were popular. They shared their passion and expertise with rich and poor, young and old, green thumbs and brown thumbs — all to provide fresh produce and flowers to area food banks and soup kitchens. They met in the garden and tossed amazing salads from the bountiful harvest and cooked up incredible soups and stews. This was gardening at its best — a shared activity that brought many different people together to do something beautiful for others. People learned by doing, and there was always a sense of playful activity and exercise — it felt good to attend these meetings. Gardening wasn’t an end in itself, but a means to an end — a hobby with purpose beyond pleasure. It was a win-win situation; those who loved gardening won, those who loved service to others won, and those who enjoyed social activities together won. So, four types of garden clubs present parallels to four types of churches. Is ours the Westwood type, gathering in nice, comfortable buildings, well-dressed, well-fed to talk about our faith and to think about good Christian living, while paying others to do ministry and mission for us? Are we Emersonians, really excited about learning and growing for our own personal benefit, swapping stories and enjoying the time we have together in our own circles of fellowship? Do we most closely resemble the Park Ridge type, taking our love out into the street and sharing it with others, training and equipping, proselytizing and promoting, evangelizing and exhorting? Or are we Hillsdale type churches, living the witness in the world, do for others while doing with others, teaching people to feed themselves while feeding others? Are mostly about flowers or food, looking good or doing good, having what we like or sharing what we have with others? We are called not merely to bear fruit, but to live it — to share it with those who need it most. So, it’s worth considering… how DOES our garden grow? Every metaphor breaks down eventually. Dan – this is such a wonderful metaphor that you have explored and shared. 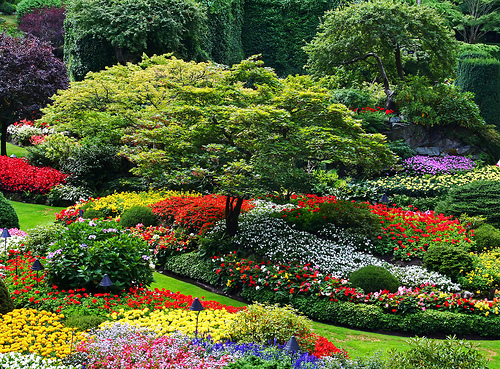 With an undergraduate degree in landscape architecture, a love for gardening and a masters in theology – coupled with twenty years of pastoral ministry – I have done much research on theology and gardens. thanks for the added inspiration. James, in the Message, addresses the invasives. I hope that the good folks in Westwood imported rare and wonderful flora (plants) rather than fauna (animals). Thanks for the post. It’s a good metaphor..